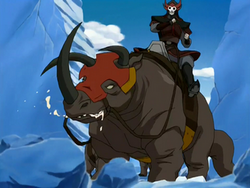 The komodo rhino is a rhinoceros like animal, often used as a mount, especially in the 100 year war. It has 2 downward curving horns, and a singular larger upward curving horn. They are an even mix of rhino and lizard, having a reptilian like jaw, a rhino like body, and a dinosaur reminiscent tail. 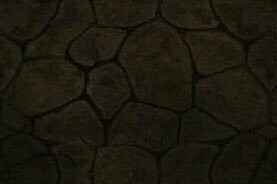 Their skin is very tough and resistant, making them well able to take blows. However, despite their rather tough hide, and their horns, they are not classified as a combat pet due to their lack of agility or abilities relating to combat. They can defiantly kill someone, but once running they can’t turn very quickly, and this it is impossible for them to hit anyone who is aware of their charge, and as loud as their running is, it’s hard not to be aware of them. They are commonly used as mounts and beasts of burden, as despite their inability to turn quickly, or run fast for any sustained time, they have a high endurance for traveling, and can carry great weights. This makes them unsuitable for using as an aid for fighting, but marvelous mounts and pack-mules. They are considered nearly ideal for mounted soldiers, as they can carry the soldier, and all their gear easily, without needing very frequent breaks.